Editors Note: A photo for this release will be available on the Marketwire website. Parmalat Canada has launched Astro BioBest probiotic yogourt with Plant Sterols to Canadians, the first and only probiotic yogourt available in Canada that offers a healthy and delicious option to consumers managing their cholesterol levels. Each 100g serving is enriched with 50 per cent of the daily amount of plant sterols recommended to help lower your cholesterol. This recommended amount in adults is 2g(1) which equates to a person eating approximately 100 pounds of raw fruits and vegetables daily or just two servings of BioBest probiotic yogourt with Plant Sterols! And what better way to try it out for yourself and witness this impressive visual firsthand than to stop by TD Plaza on October 13th for a taste! 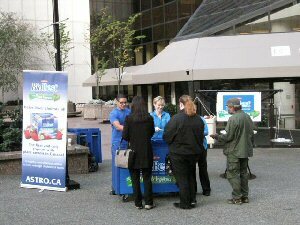 Not only will Canadians be given a cup of yogourt as they make their way around the city, they will be able to take a good look at what 100 pounds of raw fruits and vegetables versus two servings of BioBest probiotic yogourt with Plant Sterols actually looks like, along with learning about plant sterols, their benefits and healthy eating. What's more, Canadians can log onto www.astro.ca to choose which two flavours best represent them by joining a flavour team for the chance to win a digital camera and more! What are you? Team Strawberry/Vanilla or Team Blueberry/Raspberry? Photo Opportunity: Life size scale demonstrating the comparison of 100 pounds of raw fruits and vegetables versus two servings of BioBest probiotic yogourt with Plant Sterols. Astro BioBest is a leading innovator in the yogourt category. Astro BioBest was the first to market with probiotic yogourts in Canada as well as other innovative products such as Omega 3, Calcium, Lactose Reduced and probiotic drinkable yogourts. Astro BioBest is now proud to be the first to market with plant sterols. For over 30 years, Astro has been committed to providing options for Canadian consumers and continues to offer a diverse product line up with additional benefits above and beyond digestive health. With over 120 years of brand heritage in the Canadian dairy industry, Parmalat Canada is committed to the health and wellness of Canadians and markets a variety of high-quality food products that help them keep balance in their lives. Parmalat Canada produces milk and dairy products, fruit juices, cultured products, cheese products and table spreads with such respected brands as Astro™, Beatrice™, Lactantia™, Black Diamond™, Cheestrings Ficello™ and Balderson™. Our employees' continued commitment to quality and innovation has helped Parmalat Canada become one of the largest, most-dynamic food group companies in Canada, employing more than 2,900 people with 18 operating facilities across Canada. Our parent company, Parmalat S.p.A., is listed on the Italian Stock Exchange in Milan under the ticker symbol PLT. BioBest Probiotic Yogourt with Plant Sterols served up to Vancouver on a beautiful fall day.